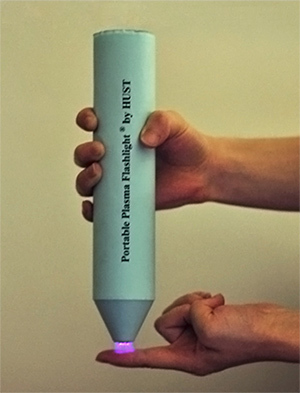 A hand-held, battery-powered plasma flashlight has been developed for destroying bacteria on skin and on surfaces. Created by a team of researchers from China and Australia, the device is intended for use in remote locations when sterilization is required. The flashlight is driven by a 12 volt battery and doesn't require any external generator or wall power. It also doesn't require any external gas feed or handling system. The device itself is fitted with resistors to stop it heating up and making it safe to touch. In the study, the plasma flashlight effectively inactivated a thick biofilm of one of the most antibiotic and heat-resistant bacteria, Enterococcus faecalis – a bacterium which often infects the root canals during dental treatments. Results showed that the plasma not only inactivated the top layer of cells, but penetrated deep into the very bottom of the layers to kill the bacteria. Co-author of the study CSRIO’s Professor Kostya (Ken) Ostrikov, said: "The bacteria form thick biofilms, which makes them enormously resistant against inactivation which is extremely difficult to implement. High temperatures are commonly used but they would obviously burn our skin. Mary stripped naked...and went through the tuned-laser decontamination process, coherent beams at precise wave-lengths passing through her flesh to zap foreign molecules within her body. There was a single, brief, dazzling burst of white light, followed by a wave of heat that filled the cubicle. He flet a moment of pain, so swift that he hardly recognized it until it was over. Cautiously, he removed the helmet and looked at his body. His skin was covered with a fine, white ash - and then he realized that the ash was his skin, or had been: the machine had burned away the outer epithelial layers. From CSIRO press release via MedGadget.